The Falcon 9 launch complex at Cape Canaveral, Florida. As of December 2017[update], SpaceX uses three leased orbital launch sites: Launch Complex 39A of the Kennedy Space Center, Space Launch Complex 40 at Cape Canaveral Air Force Station, both in Florida, and Space Launch Complex 4E of the Vandenberg Air Force Base in California. Space Launch Complex 40 was damaged in the Amos-6 accident on September 2016 and repair work was completed by December 2017. SpaceX is also building a commercial-only launch facility at the Boca Chica site near Brownsville, Texas and is expected to be operational no earlier than 2019. In addition, SpaceX uses a suborbital test facility, the SpaceX Rocket Development and Test Facility in Texas. A high-altitude suborbital test facility was under construction in New Mexico, but was abandoned following the switch to flight tests on commercial missions. SpaceX has indicated that they see a niche for each of the four orbital facilities currently in use or under construction, and that they have sufficient launch business to fill each pad, particularly so by the end of the decade if SpaceX business remains strong. SpaceX operates three active launch facilities: Cape Canaveral Air Force Station (CCAFS), Vandenberg Air Force Base (VAFB), and a third at Kennedy Space Center (KSC). 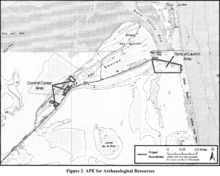 A fourth launch site is under construction, as of 2017, at Boca Chica Village, Texas. SpaceX believes that they can optimize their launch operations, and reduce launch costs, by dividing their launch missions amongst these four launch facilities: KSC for NASA work, CCAFS for USAF national security launches, VAFB for polar launches, and Boca Chica for commercial launches. COO Gwynne Shotwell stated in 2014 that "we are expanding in all of our locations" and "you will end up seeing a lot of SpaceX launch sites in order to meet the future demand that we anticipate." As of June 2016[update], SpaceX discussed preliminary plans to launch an average of 90 rockets per year after 2019. SpaceX have indicated that, depending on market demand, they may actually need another commercial launch site in addition to the Texas location. In 2016, SpaceX signed a five-year lease to use a 53,000 square foot former Spacehab building at Port Canaveral. A new building nearby is also planned, and these facilities would be used to refurbish rockets. Falcon 9, Flight 3, above SpaceX Cape Canaveral launch complex, May 2012. In 2007, the US Air Force leased Cape Canaveral SLC-40 to SpaceX to launch the Falcon 9 rocket. During April 2008, construction started on the ground facilities necessary to support the launch of the SpaceX Falcon 9 rocket. Renovations included installation of new liquid oxygen and kerosene tanks and construction of a hangar for rocket and payload preparation. The first Falcon 9 rocket arrived at SLC-40 in late 2008, and was first erected on January 10, 2009. It successfully reached orbit on its maiden launch on June 4, 2010, carrying a dummy payload qualification unit. SpaceX modified the launch pad in 2013 in order to support launches of the Falcon 9 v1.1 launch vehicle, a 60 percent heavier rocket with 60 percent more thrust on realigned engines and 60 percent longer fuel tank than the v1.0 version of the Falcon 9, requiring a modified transporter/erector. In September 2016, the pad was damaged when a Falcon 9 rocket exploded during liquid oxygen loading in preparation for a hot-fire test. The pad was repaired and used for the first time since the explosion in the SpaceX CRS-13 mission in December 2017. 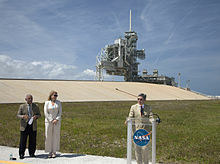 Robert D. Cabana, director of KSC, announces the signing of the LC-39A lease agreement on April 14, 2014. In December 2013, NASA and SpaceX were in negotiations for SpaceX to lease Launch Complex 39A at the Kennedy Space Center in Florida, after SpaceX was selected in a multi-company bid process, following NASA's decision in early 2013 to lease the unused complex out as part of a bid to reduce annual operation and maintenance costs of unused government facilities. The SpaceX bid was for exclusive use of the launch complex to support their future crewed missions, but SpaceX said in September 2013 that they are also willing to support a multi-user arrangement for LC-39A, and they reiterated that position in December 2013. A competing bid for commercial use of the launch complex was submitted by Jeff Bezos' Blue Origin, who bid for a shared non-exclusive use of the complex such that the launchpad can interface with multiple vehicles, and costs of pad operational expenses could be shared over the long term. One potential shared user in the Blue Origin notional plan was with United Launch Alliance. In September 2013—prior to completion of the bid period, and prior to any public announcement by NASA of the results of the process—Blue Origin filed a protest with the U.S. General Accounting Office (GAO) over what it said was "a plan by NASA to award an exclusive commercial lease to SpaceX for use of mothballed space shuttle launch LC-39A." NASA planned to complete the bid award and have the pad transferred by October 1, 2013, but the protest delayed a decision until after the GAO resolved the protest. Following the eruption of the controversy, on September 21, SpaceX said that they were willing to support a multi-user arrangement for LC-39A. In December 2013, the GAO denied the protest and sided with NASA, which argued that the solicitation contains no preference on the use of the facility as multi-use or single-use. "The [solicitation] document merely asks bidders to explain their reasons for selecting one approach instead of the other and how they would manage the facility." SpaceX began architectural and engineering design work on the pad modifications in 2013, and signed the contractual documents to lease the pad for 20 years from NASA in April 2014. SpaceX is building a large Horizontal Integration Facility (HIF) just outside the perimeter of the existing launch pad in order to "house the Falcon [rockets] and associated hardware and payloads during processing." This is a marked difference from the vertical integration facility used by previous US government rockets that used the launch pad (Apollo Program and the Space Shuttle)—plus the installation of all new instrumentation and control systems, with substantial new plumbing for a variety of rocket liquids and gasses. The Falcon rockets will be transported from the HIF to the launch pad aboard a Transporter Erector (TE) which will ride on rails up the former crawlerway path. In February 2016, it was reported that the pad was completed and activated indicating it is ready for launches of Falcon 9 Full Thrust. The first SpaceX launch from LC-39A occurred in February 2017, followed by a successful first-stage landing at Landing Zone 1. Further work will be needed to support Falcon Heavy and crewed launches which is expected to take at least 60 days and is currently planned to occur after Cape Canaveral LC-40 is back in operation, not earlier than October 2017. SpaceX's first crewed space missions are expected to launch in 2019 from the Kennedy LC-39A launch pad. In April 2018, SpaceX completed a draft environmental assessment for a new facility "that would include a booster processing hangar and launch control center on 67 acres (27 ha) of KSC property" to support a faster flight rate of "Falcon rockets, including processing of landed booster stages and recovered payload fairings for reuse." SpaceX operate a West Coast launch site located at Vandenberg AFB Space Launch Complex 4 in order to deliver satellites to polar or Sun-synchronous orbits with Falcon 9 and Falcon Heavy launches. SpaceX broke ground at Vandenberg in July 2011. A 2011 estimate showed that the project was expected to cost between $20 to $30 million for the first 24 months of construction and operation; thereafter, operational costs were expected to be $5–10 million per year. The sixth flight of the Falcon 9 launch vehicle launched in September 2013, which was the maiden flight of Falcon 9 v1.1. The site was used for a second time in January 2016 for the Jason-3 launch (which was the last flight of Falcon 9 v1.1) and for a third time in January 2017 for the first of the Iridium Next launches. Map showing proposed locations of the control center and vertical launch area at the Texas facility, from the FAA draft Environmental Impact Statement, April 2013. SpaceX is building a new spaceport at Boca Chica Village near Brownsville, Texas for their private use, with an emphasis on commercial space transport work. The site is to be optimized for launches of commercial telecommunication satellites that would be launched to the east, across the Gulf of Mexico into geostationary transfer orbits. During 2011–2014, SpaceX considered as many as seven potential locations around the country for a new private launch facility for orbital flights, including Alaska, California, Florida, Texas, Virginia, Georgia, and Puerto Rico. One of the proposed locations for the new commercial-mission-only spaceport was south Texas, which was revealed in April 2012, via preliminary regulatory documentation. The FAA's Office of Commercial Space Transportation began a multi-year process to conduct an Environmental Impact Statement and public hearings on the new launch site, which would be located in Cameron County, Texas. The site was to initially support up to 12 commercial launches per year, including two Falcon Heavy launches. SpaceX broke ground on the new spaceport in 2014, then indicating that the first launches from the facility would occur no earlier than 2016. Foundation and subsoil issues at the site subsequently resulted in moving that planning date out into 2018 as of early 2016, and to "late 2018" by September 2016. The first Falcon 1 at SpaceX's leased launch pad at Vandenberg Air Force Base, California. This vehicle was removed from VAFB due to delays and eventually launched from Omelek Island. SpaceX originally intended to launch their first launch vehicle, the Falcon 1, from Space Launch Complex 3 West (SLC-3W) at Vandenberg Air Force Base. SLC-3W was modified by SpaceX to support the Falcon 1, and the Falcon 1 was erected on the pad in 2005. Problems arose when SpaceX was unable to obtain sufficient launch window availability because the pad would overfly other Air Force pads that were frequently left occupied for weeks or months at a time, thus severely restricting SpaceX launches. Ultimately, this launch pad was never used for orbital launch, although it was used for a number of ground tests. SpaceX proceeded to then[when?] build a launch facility in the northern Pacific Ocean at the Ronald Reagan Ballistic Missile Defense Test Site, on Omelek Island, a part of the Kwajalein Atoll, Marshall Islands. SpaceX began launching Falcon 1 rockets from Omelek in 2006. Falcon 1 Flight 4 was the first successful privately funded, liquid-propelled launch vehicle to achieve orbit, and was launched from Omelek Island on 28 September 2008, followed by another Falcon 1 launch on 13 July 2009, placing RazakSAT into orbit. SpaceX originally planned to upgrade the Omelek launch site for use by the Falcon 9 launch vehicle, but later cancelled their plans to do so, and have since disassembled the entire installation. In December 2010, the SpaceX launch manifest listed Omelek (Kwajalein) as a potential site for several Falcon 9 launches, the first planned for as early as 2012. The "Falcon 9 Overview" document also offered Kwajalein as a launch option in 2010. Since then, the FAA Environmental Impact Report of May 2014 lists this site as non-operational and returned to its original state, to no longer be used, "Five Falcon 1 launches occurred at Omelek Island, Kwajalein Atoll. After these launches of the Falcon 1, the site was no longer needed and SpaceX closed the site and returned the property to pre-launch conditions". All Falcon 1 launches took place at this location, five launches from 2006 to 2009. SpaceX abandoned Omelek when Falcon 1 was retired, due to the expense of logistics. The super-heavy-lift launch vehicle under development for the SpaceX Mars transportation infrastructure—currently known by its code name BFR, and formerly known as the ITS launch vehicle and before that, the Mars Colonial Transporter—was initially deemed too large to launch from any existing SpaceX facility. In 2014, SpaceX indicated that the historic Florida launchpad LC-39A would not be large enough, and they planned to build a new site to accommodate the 10-meter-diameter (33 ft) rocket. The BFR is projected to be powered by thirty-one (31) Raptor liquid oxygen/liquid methane engines producing approximately 52.7 MN (11.8×10^6 lbf) of thrust at liftoff. However, in his September 2016 presentation, Elon Musk stated that the large launch vehicle would indeed be launched from LC-39A, like the Apollo Moon missions. SpaceX has two rocket test facilities for vertical takeoff, vertical landing rockets: the SpaceX Rocket Development and Test Facility in McGregor, Texas and a leased test facility at Spaceport America in southern New Mexico. All SpaceX rocket engines are tested on rocket test stands, and low-altitude VTVL flight testing of the Falcon 9 Grasshopper v1.0 test vehicle are done at McGregor. High-altitude, high-velocity flight testing of Grasshopper v1.1 were planned to be done at Spaceport America. In addition to atmospheric flight testing, and rocket engine testing, the McGregor facility is also used for post-flight disassembly and defueling of the Dragon spacecraft following orbital missions. Both flight test facilities are principally involved in developing and testing various elements of the SpaceX reusable launch system development program, with a goal to making future SpaceX launch systems fully and rapidly reusable. SpaceX's Rocket Development and Test Facility in McGregor, Texas is used for research and development of new rocket engines and thrusters as well as for testing final manufactured engines, various components, and engines during development. Although SpaceX manufactures all of their rocket engines and thrusters at their Hawthorne headquarters, each must pass through McGregor where the company tests each new engine off of the assembly line as well as those being developed for future missions to orbit and beyond before each one can be used on a flight mission. "The company's headquarters and factory in ... southern California gets a lot of the attention, but most of the noisy, dirty and critical testing work is done just outside this small central Texas town nestled in amid the farm fields." Extensive and repeated rocket engine testing is a key to increasing reliability and thereby mission success, while lowering operating cost for SpaceX. Dragon spacecraft, following use on a space mission, splashdown and recovery, are shipped to McGregor for de-fueling, cleanup, and refurbishment for potential reuse in flight missions. The first scaled methane-fueled Raptor rocket engine, manufactured at the Hawthorne facility in California, shipped to McGregor by August 2016 for development testing. In 2011, the company announced plans to upgrade the facility for launch testing a VTVL rocket, known as Grasshopper, and then constructed a half-acre concrete launch facility in 2012 to support the test flight program. After 8 flights of Grasshopper, and 5 flights of its successor "F9R Dev1" between 2012 and 2014, the FAA permit to fly Grasshopper flight tests in Texas expired in October 2014. In 2003, the company leased the McGregor testing facilities of defunct Beal Aerospace—on land formerly used for the World War II Bluebonnet Ordnance Plant—where it refitted the largest test stand at the facilities for Falcon 9 engine testing. SpaceX has made a number of improvements to the facility since purchase, and has also extended the size of the facility by purchasing several pieces of adjacent farmland. The area to support the test facility was initially just 256 acres (104 ha) but by April 2011 this more than doubled to over 600 acres (240 ha). With only three initial employees onsite, the facility grew to over 140 employees by late 2011. As of October 2012[update], the McGregor facility consisted of seven test stands operated 18 hours a day, six days a week, and was building more test stands because production was ramping up and the company had a large manifest in the next several years. As of September 2013[update], the McGregor facility operated 11 test stands involved in the rocket engine test program, and was averaging two tests each day. The largest test stand by 2013 was the 82 meters (269 ft) tall Falcon 9 tripod. As of March 2015[update], the facility comprised 4,000 acres (1,600 ha), with 12 test stands; it had run over 4000 Merlin engine tests, including some 50 firings of the integrated nine-engine first stage. In May 2016, the McGregor City Council instituted more restrictive rules on rocket engine, rocket stage, and low-altitude flight testing. SpaceX has not commented publicly on how the new rules will affect their testing operations, nor whether they will be evaluating other locations where they might conduct such testing. As part of the SpaceX reusable launch system development program, SpaceX announced in May 2013 that the follow up to Grasshopper, a high-altitude, vertical takeoff, vertical landing (VTVL) suborbital technology demonstrator would be tested at Spaceport America near Las Cruces, New Mexico. SpaceX signed a three-year lease for land and facilities at the recently operational spaceport. As of May 2013[update], SpaceX indicated that they did not yet know how many jobs would move from McGregor, Texas to New Mexico to support the second phase of VTVL Grasshopper testing. In 2013, SpaceX constructed a 30-by-30-meter (98 ft × 98 ft) pad at Spaceport America, 7 kilometers (4.3 mi) southwest of the spaceport's main campus, and will lease the pad for US$6,600 per month plus US$25,000 per Grasshopper flight. The spaceport administrator expected SpaceX to be operational at the Spaceport between October 2013 and February 2014, and anticipated that the lease payments would begin at that time. By May 2014, SpaceX expended more than US$2 million on construction of the New Mexico facility, and is using more than 20 local firms to work on the project. Work items have included modifying the Range Operations Plan as well as a variety of fire-prevention measures. While in July 2014 the first test flight was still expected to occur sometime in 2014, reports in October 2014 indicated that the first flight of F9R Dev2 at Spaceport America would not occur until the first half of 2015. On 19 February 2015, SpaceX announced that the F9R Dev2 would be discontinued indicating that ocean tests using operational Falcon 9 rockets were sufficiently successful that it was no longer necessary. Instead the New Mexico site will be used for testing the returned first stages. During April 2015, SpaceX performed tanking tests on the In-Flight Abort rocket on the Vandenberg Air Force Base SLC-4E. Since this rocket only possessed three Merlin 1D engines, it was speculated that the discontinued F9R Dev2 was re-purposed as the launch vehicle in the In-Flight Abort Test. ^ a b "Launch operators expect minimal delays from Hurricane Irma – Spaceflight Now". spaceflightnow.com. ^ a b c d e f g h i Clark, Stephen (2013-10-18). "SpaceX says robust market can support four launch pads". Spaceflight Now. Retrieved 2013-10-27. ^ Gwynne Shotwell (2014-03-21). Broadcast 2212: Special Edition, interview with Gwynne Shotwell (audio file). The Space Show. Event occurs at 49:50–50:40. 2212. Archived from the original (mp3) on 2014-03-22. Retrieved 2014-03-22. ^ "Port Commissioner: SpaceX negotiating Port lease to refurbish rocket boosters". Fox35 Local News. 2016-06-23. Retrieved 2016-07-01. ^ Dave Berman (November 23, 2016). "SpaceX plans five-year lease of Port Canaveral complex". Florida Today. Retrieved 15 June 2017. ^ Nick Statt (Aug 24, 2016). "SpaceX is building new facilities at Port Canaveral to refurbish rockets". The Verge. Retrieved 15 June 2017. ^ Kelly, John (April 25, 2007). "SpaceX cleared for Cape launches". Florida Today. Archived from the original on September 30, 2007. Retrieved June 5, 2010. ^ Shanklin, Emily (January 12, 2009). "SpaceX's Falcon 9 on Launch Pad at Cape Canaveral". SpaceX.com. Retrieved June 5, 2010. ^ Klotz, Irene (2013-09-06). "Musk Says SpaceX Being "Extremely Paranoid" as It Readies for Falcon 9's California Debut". Space News. Retrieved 2013-09-13. ^ "SpaceX Falcon 9 rocket, satellite destroyed in explosion". Florida Today. ^ Gebhardt, Chris (December 6, 2017). "SLC-40 comes back to life with CRS-13 static fire campaign". NASASpaceFlight.com. Retrieved November 15, 2018. ^ "SpaceX to bid for rights to historic NASA launch pad". Phys.org. 2013-12-13. Retrieved 2013-12-15. ^ a b Matthews, Mark K. (2013-08-18). "Musk, Bezos fight to win lease of iconic NASA launchpad". Orlando Sentinel. Retrieved 2013-08-21. ^ a b Foust, Jeff (2013-09-21). "A minor kerfuffle over LC-39A letters". Space Politics. Retrieved 2013-09-25. ^ Boyle, Alan (2013-12-13). "SpaceX wins NASA's nod to take over historic Launch LC-39A". NBC News. Retrieved 2013-12-18. ^ a b Messier, Doug (2013-09-10). "Blue Origin Files Protest Over Lease on LC-39A". Parabolic Arc. Retrieved 2013-09-11. ^ Messier, Doug (2013-12-12). "Blue Origin Loses GAO Appeal Over LC-39A Bid Process". Parabolic Arc. Retrieved 2013-12-13. ^ a b Dean, James (2014-04-15). "With nod to history, SpaceX gets launch LC-39A OK". Florida Today. Retrieved 2014-04-15. ^ "NASA signs over historic Launch Pad 39A to SpaceX". collectSpace. 2014-04-14. Retrieved 2014-11-19. ^ a b Bergin, Chris (2014-11-18). "Pad 39A – SpaceX laying the groundwork for Falcon Heavy debut". NASA Spaceflight. Retrieved 2014-11-17. ^ Jeff Foust (February 4, 2016). "SpaceX seeks to accelerate Falcon 9 production and launch rates this year". Space News. Retrieved 15 June 2017. ^ SpaceX proposing expansion of Florida launch processing facilities, 11 June 2018, accessed 12 June 2018. ^ a b Robbins, Rebecca (2011-07-15). "Men to Mars from Vandenberg?". Retrieved 2011-07-15. ^ Reisinger, Don (2011-07-15). "SpaceX breaks ground on Falcon Heavy launch site". CNET. Retrieved 2011-07-15. ^ Berger, Eric (5 August 2014). "Texas, SpaceX announce spaceport deal near Brownsville". MySanAntonio.com. Retrieved 2014-08-05. ^ "SpaceX breaks ground at Boca Chica beach". Brownsville Herald. 2014-09-22. ^ Dean, James (2013-04-03). "Proposed Shiloh launch complex at KSC debated in Volusia". Florida Today. Retrieved 2013-04-06. ^ "Details Emerge on SpaceX's Proposed Texas Launch Site". Space News. 2012-04-16. p. 24. SpaceX is considering multiple potential locations around the country for a new commercial launch pad. ... The Brownsville area is one of the possibilities. ^ Rush, Johna Strickland (2012-11-15). "Spaceport could land in Camden". Tribune & Georgian. Archived from the original on 2013-02-04. Retrieved 2012-11-20. ^ "FAA Notice of Intent to conduct an Environmental Impact Statement" (PDF). Federal Aviation Administration. 3 Apr 2012. Retrieved 15 June 2017. ^ "SpaceX Proposes New Texas Launch Site". 2012. Retrieved 15 June 2017. ^ Berger, Eric (2012-05-25). "Texas reaches out to land spaceport deal with SpaceX". Houston Chronicle. Retrieved 2012-05-27. ^ a b Foust, Jeff (2013-04-01). "The great state space race". The Space Review. Retrieved 2013-04-03. ^ a b Martinez, Laura B. (2013-04-15). "FAA shares SpaceX EIS report". The Brownsville Herald. Retrieved 2013-04-17. 'no impacts would occur' that would force the Federal Aviation Administration to deny SpaceX a permit for rocket operations near Brownsville. ^ "Foundation Problems Delay SpaceX Launch". Frankly Media. Jan 19, 2016. Retrieved 15 June 2017. ^ Stephen Clark (September 6, 2016). "SpaceX may turn to other launch pads when rocket flights resume". Spaceflight Now. Retrieved 15 June 2017. ^ "Spaceflight Now - Falcon Launch Report - Mission Status Center". 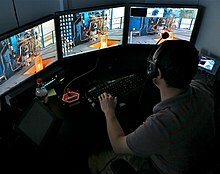 www.spaceflightnow.com. ^ "Launch Manifest". SpaceX. Retrieved 28 December 2010. ^ "Falcon 9 Overview, Performance". SpaceX. 2010. Retrieved 2010-12-28. ^ "FEIS SpaceX Texas Launch Site Vol I" (PDF). FAA. 2014. ^ Gwynne Shotwell (2014-03-21). Broadcast 2212: Special Edition, interview with Gwynne Shotwell (audio file). The Space Show. Event occurs at 20:00–21:10 and 22:15–22:35. 2212. Archived from the original (mp3) on 2014-03-22. Retrieved 2014-03-22. ^ Elon Musk (29 September 2017). Becoming a Multiplanet Species (video). 68th annual meeting of the International Astronautical Congress in Adelaide, Australia: SpaceX. Retrieved 2017-12-14 – via YouTube. ^ Bergin, Chris (2016-09-27). "SpaceX reveals ITS Mars game changer via colonization plan". NASASpaceFlight.com. Retrieved 2016-09-27. ^ Gannes, Liz (2013-05-30). "36:03". Tesla CEO and SpaceX Founder Elon Musk: The Full D11 Interview (Video). All Things D (Video interview). Retrieved 2013-05-31. hopeful that sometime in the next couple of years we'll be able to achieve full and rapid reusability of the first stage—which is about three-quarters of the cost of the rocket—and then with a future design architecture, achieve full reusability. ^ a b c Sanchez, Sandra (22 December 2011). "SpaceX: Blasting into the future — A Waco Today interview with Elon Musk". Waco Tribune. Retrieved 7 October 2015. ^ a b c d Paur, Jason (2012-10-10). "Inside SpaceX's Texas Rocket-Testing Facility". Wired. Retrieved 2012-12-31. ^ Bergin, Chris (2013-06-20). "Reducing risk via ground testing is a recipe for SpaceX success". NASAspaceflight.com. Retrieved 2013-08-21. ^ Berger, Eric (10 August 2016). "SpaceX has shipped its Mars engine to Texas for tests". Ars Technica. Retrieved 18 August 2016. ^ Mohney, Doug (2011-09-26). "SpaceX Plans to Test Reusable Suborbital VTVL Rocket in Texas". Satellite Spotlight. Retrieved 2011-11-23. ^ "Reusable rocket prototype almost ready for first liftoff". Spaceflight Now. 2012-07-09. Retrieved 2012-07-13. SpaceX has constructed a half-acre concrete launch facility in McGregor, and the Grasshopper rocket is already standing on the pad, outfitted with four insect-like silver landing legs. ^ U.S. Federal Aviation Administration (November 2011) "Final Environmental Assessment for Issuing an Experimental Permit to SpaceX for Operation of the Grasshopper Vehicle at the McGregor Test Site, Texas", p. 1. ^ SpaceX [@SpaceX] (18 September 2013). "Texas Spotlight: With 11 test stands, incl. our 82m Falcon 9 tripod, our 900-acre TX site averages 2 tests/day!" (Tweet) – via Twitter. ^ a b Gwynne Shotwell (17 March 2015). "Statement Of Gwynne Shotwell, President & Chief Operating Officer, Space Exploration Technologies Corp. (SpaceX)" (PDF). Congressional testimony. US House of Representatives, Committee On Armed Services Subcommittee On Strategic Forces. Retrieved 2016-01-11. SpaceX’s 4,000 acre Rocket Development Facility in Central Texas includes 12 test stands that support engine component testing; design, qualification and acceptance testing of Merlin engines; structural testing of the first and second stages; and fully integrated stage testing for full mission durations. The state-of-the-art facility has remote and/or automatic controls and high-speed data acquisition systems, and post test data are available for analysis upon test completion. ^ "McGregor: City modifies SpaceX rocket testing rules". KWTX10 News. 2016-05-10. Retrieved 2016-08-29. ^ Lindsey, Clark (2013-05-07). "SpaceX to test Grasshopper reusable booster at Spaceport America in NM". NewSpace Watch. Retrieved 2013-05-07. (Subscription required (help)). ^ "SpaceX Joining Virgin Galactic at Spaceport America". Sci-Tech Today. 2013-05-08. Retrieved 2013-05-09. SpaceX will be paying $6,600 a month to lease a mobile mission control facility and will pay the state $25,000 per launch. ^ Abbot, Joseph (2013-05-07). "SpaceX moving Grasshopper testing to New Mexico". Waco Tribune. Retrieved 2013-05-08. ^ Leone, Dan (2013-05-13). "SpaceX Leases Pad in New Mexico for Next Grasshopper Tests". SpaceNews. Retrieved 2013-08-03. ^ Robinson-Avila, Kevin (2013-10-24). "Countdown to launch". Albuquerque Journal. Retrieved 2014-04-03. ^ David, Leonard (2014-05-07). "New Mexico's Spaceport America Eyes SpaceX, Virgin Galactic Flights". Inside Outer Space. Retrieved 2014-07-30. ^ Businesses prepare for first flight Archived 2014-08-08 at the Wayback Machine, Las Cruces Bulletin, Alta LeCompte, 11 July 2014, accessed 30 July 2014. ^ Messier, Doug (2014-10-21). "New Mexico Legislators Look into Spaceport America Finances". Parabolic Arc. Retrieved 2014-10-23. ^ Klotz, Irene (2015-02-19). "SpaceX bypassing replacement for lost Falcon 9R landing test vehicle". Portal To The Universe. Retrieved 2015-12-24. ^ Bergin, Chris (2015-04-10). "SpaceX conducts tanking test on In-Flight Abort Falcon 9". nasaspaceflight.com. Retrieved 2015-05-10.